← Historic Buildings Show the Way to Build Durable Stone Facades for New Construction. A Last Look at Historic Wood Windows. SOME SPECIFIERS RELUCTANT TO RESTORE HISTORIC WINDOWS (Photo courtesy of Marlowe Restorations). 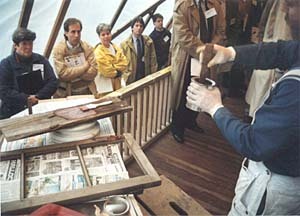 Paul Marlowe of Marlowe Restorations demonstrates window conservation techniques on the porch of his 1865 home in Connecticut. The occasion is a seminar for architects presented by the AIA/CT Continuing Education Commission. Such events help designers to better understand window conservation so that they can specify it more confidently. Wood windows are perhaps the most vulnerable of historic elements, with many millions being dumped in landfills each year. Their conservation is a worthy goal from an historic and environmental perspective, but is it reasonable to expect owners to subsidize these values through higher energy and maintenance costs? That is how the multi-billion dollar window replacement industry prefers to frame the question. For the restorer’s version of the relative costs of historic wood windows, we consulted with Paul Marlowe, of Marlowe Restorations, a Northford, Connecticut company specializing in wood conservation issues. According to Paul Marlowe, new wood replacement windows cannot equal the durability of a fully restored historic window. A melancholy consequence of industrial development is that old growth lumber from virgin forests has become extremely scarce. Experience has shown that second growth lumber of even the highest commercial grade can begin to rot after just a decade to the weather. He asserts that old growth lumber is a precious and durable resource and that these windows are therefore an asset deserving of full consideration. The biggest problem for production windows is not rotting wood, after all, most windows are vinyl or aluminum, the problem is the short expected life of the glazing. The lifetime guarantee furnished with many replacements is often, in effect, the lifetime of the sealed glazing units. Current experience is that after about fifteen years the seals fail allowing the entrance of water vapor, fog, into the cavity. Due to a number of factors, mostly overall window quality and parts availability issues, it will frequently be more practical to replace the entire unit rather than the glazing only. The industry periodically claims to have solved this problem but as the failures persist we will have to wait and see. Welcome to the ongoing cycle of window replacement. Restoration costs will vary considerably from window to window. The cost of a fully restored and equipped historic window will be four or five times that of an inexpensive replacement. This expense will be made up over the life of the restored window by avoiding the cost of repeated replacement. Paul Marlowe says that a complete wood window restoration will cost $1,500 per unit for an average double hung, multiple light unit up to $4,500 for special conditions. A complete restoration includes durable epoxy repairs, borate wood preservation strategies, installation of an array of weatherseals, resetting of all the glazing, painting and installation of a storm. An important factor in the retirement of wood windows has been the assumption that they cannot be made energy efficient. The trials that established this truism were performed under the persuasive influence of the replacement industry using comparisons with poorly maintained and poorly equipped existing windows. A properly fitted, glazed and weather sealed window equipped with a high quality storm, inside or outside, will meet modern standards for energy efficiency. A skilled restoration specialist will make these low tech assemblies operable and energy efficient and return to them their original life expectancy. There are times when restoration of a given window part may not be structurally advisable. There is some range of opinion of what is an appropriate material for reproduction sash and parts. Caroline Sly of Ashfield, Massachusetts is an architectural joiner who specializes in hand tooled museum quality 18th century reproductions. While she agrees that first growth material is much more durable, she finds that it is unavailable in the eastern pine species that she requires for her work. She asserts that she can acquire material of a suitable durability by diligently hand selecting vertical grain heartwood from native lumber at local sawmills. She declines to use salvage both because it is a threat to her tools and because it is inauthentic. In contrast, Bill Hewittson of Weston Millwork in Weston, Missouri can find the western fir and longleaf pine he uses as first growth salvage. He agrees with Caroline Sly, however, that very highly selected wood grades will outperform the norm for second growth lumber. He also treasures his restored 19th century sash making machines but wants to furnish a sash of historic durability for customers that specify it. He charges a premium for milling salvage. Liz Dieter of Duluth Timber in Duluth, Minnesota tells us that her company furnishes window makers with the short blanks they need for their work in first growth western species. This material is salvaged from industrial sites, scanned for imbedded iron, custom graded and resawn. She believes that returning this material to historic structures is its highest possible use. Costs for faithful reproduction sash produced from either salvaged first growth or from very highly selected second growth lumber will be roughly equivalent to sash restoration. Fearing to slight the multi-billion dollar window replacement industry, we also spoke to Franz Brun of SwissShade and Security of Tucson, Arizona, who represents the German custom window maker Fauser. He gave us a short history of the German experience with window restoration issues, noting that wartime destruction and the extreme age of the buildings produced a dramatic surge in demand for replacement windows. The government stepped in and set minimum standards for both quality of replacements and for a level of period detail. These master window makers can produce virtually any level of detail and/or performance in a technologically advanced production setting. Preservation trends in Europe often foreshadow those here so it is worth wondering if the replacement option will become more viable if the domestic industry can make a greater commitment to quality and detail. The cost of these imported custom replacements is roughly equivalent to that of a fully restored historic window. Paul Marlowe says that one needn’t be a partisan advocate of historic preservation to consider restoring historic wood windows as they hold their own with regard to overall cost. In an environment where budget and schedule can dictate choices, working with the restoration artisan is the most efficient way to establish costs and options. He advises clients that it is useful to look to the future when dealing with historic structures, regardless of the budget. If present means can only support an inexpensive replacement window, they are advised to preserve their options by labeling restorable sash and safely storing it against the day when different circumstances may apply. It will not pay to underestimate the long term value of this irreplaceable historic fabric. List of Wood Window Restoration Specialists. This entry was posted in Reproduction, Window Restoration and tagged Arizona, Connecticut, Massachusetts, Minnesota, Missouri. Bookmark the permalink.